If you still haven’t gotten your flu shot yet, then it probably won’t do much good now. If you’ve shirked your societal responsibility by not getting vaccinated against influenza and managed to avoid getting sick, congrats! You’re probably out of the woods now. The latest surveillance report from the Centers for Disease Control and Prevention indicates this especially severe flu season is finally winding down. For the week ending March 31, the CDC reported, only 2.4 percent of visits to a doctor were prompted by flu-like symptoms. 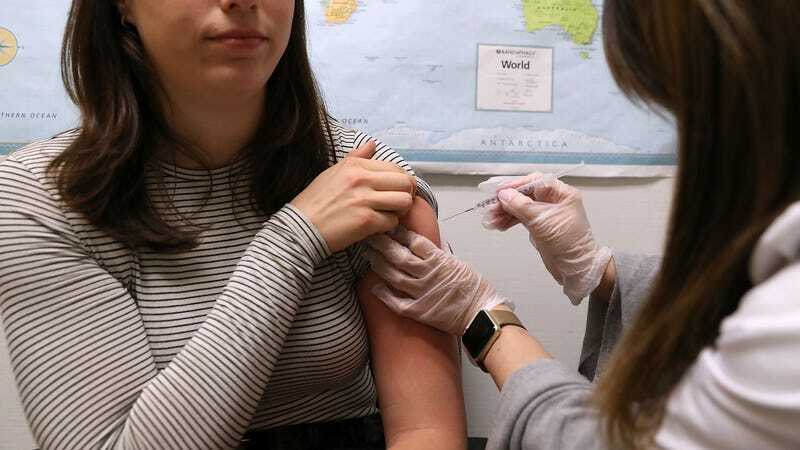 That’s a drop from the rate of 2.5 percent of visits seen the week prior, though it is still a smidge above the baseline rate of 2.2 percent seen outside the flu season. The proportion of reported deaths caused by flu and pneumonia (7.1 percent of all documented deaths) during the week of March 17 was below epidemic levels as well. The flu remained geographically widespread in 11 states, as well as in Guam and Puerto Rico. But the level of flu activity was high in only two states—Alaska, where the season often ends later, and Virginia—and low to minimal in 30 states, as well as in Puerto Rico and Washington DC. But given that the flu vaccine takes about two weeks to become effective, and that the CDC’s numbers are a week behind as is—then yes, there’s likely not much good it’d do you to rush out now and get your flu shot. You win. Of course, contrary to what your paranoid cousin might think, your imperviousness to infection had nothing to do with you not getting the shot. It was just plain luck. The flu shot does not, and cannot, give you the flu. And though it isn’t always very effective, including this season, it still offers some degree of protection you wouldn’t otherwise get (and it’ll make your week of hell a little less awful if you do get sick!). For those most vulnerable, like the very young and old, the vaccine can even be life-saving. So please, just get the damn shot come next fall.